I installed cygwin with all the packages on windows 7 64 bit. For some reason the make command is giving me an error: bash make: command not found. I checked and in my bin folder, there is no make.exe. Can anyone help me on this? I really need make to work in CYGWIN. I dont wanna have to go to windows xp. You probably have not installed make. Restart the cygwin installer, search for make, select it and it should be installed. By default the cygwin installer does not install everything for what I remember. While instaling (updating) check 'Devel' to 'Install', it will install a lot of MB but helps. I don't have time to check which exacly I (we) need. There are listed what is exactly needed. Under library - go to devel. under devel scroll and find make. install all of library with name make. click next, will take some time to install. 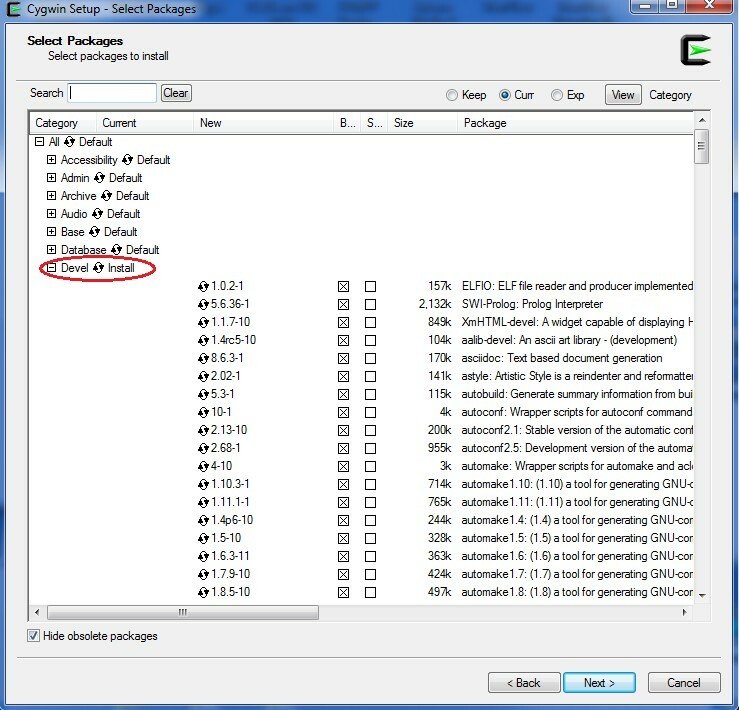 when selecting packages at installation or update search for 'make' in searchbox and select the boxes showing 'make' and also 'gcc' mostly found in devel package. I had the same problem and it was due to several installations of cygwin. Check the link (the icon) that you click on to start the terminal. In case it does not point to the directory of your updated cygwin installation, you have the wrong installation of cygwin. When updating, double check the location of cygwin, and start exactly this instance of cygwin. Goto the installer once again. Select all the libraries by clicking and selecting install (the one already installed will show reinstall, so don't install them). I faced the same problem too. Look up to the left side, and select (full). (Make), (gcc) and many others will appear. You will be able to chose the search bar to find them easily. Not the answer you're looking for? Browse other questions tagged c++ makefile cygwin command or ask your own question. cygwin net start sshd command not found error ?.